This article is a follow on to my previous article on analyzing data with python. I am going to build on my basic intro of IPython, notebooks and pandas to show how to visualize the data you have processed with these tools. I hope that this will demonstrate to you (once again) how powerful these tools are and how much you can get done with such little code. I ultimately hope these articles will help people stop reaching for Excel every time they need to slice and dice some files. The tools in the python environment can be so much more powerful than the manual copying and pasting most people do in excel. I will walk through how to start doing some simple graphing and plotting of data in pandas. I am using a new data file that is the same format as my previous article but includes data for only 20 customers. If you would like to follow along, the file is available here. As described in the previous article, I’m using an IPython notebook to explore my data. First we are going to import pandas, numpy and matplot lib. I am also showing the pandas version I’m using so you can make sure yours is compatible. Next, enable IPython to display matplotlib graphs. We will read in the file like we did in the previous article but I’m going to tell it to treat the date column as a date field (using parse_dates ) so I can do some re-sampling later. I can see that my average price is $56.18 but it ranges from $10.06 to $99.97. I am showing the output of dtypes so that you can see that the date column is a datetime field. I also scan this to make sure that any columns that have numbers are floats or ints so that I can do additional analysis in the future. We have our data read in and have completed some basic analysis. Let’s start plotting it. First remove some columns to make additional analysis easier. This representation has multiple lines for each customer. 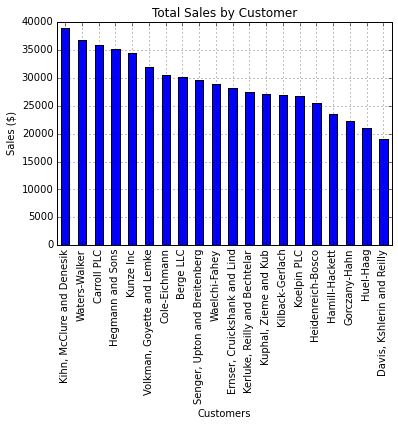 In order to understand purchasing patterns, let’s group all the customers by name. We can also look at the number of entries per customer to get an idea for the distribution. Now that our data is in a simple format to manipulate, let’s determine how much each customer purchased during our time frame. The sum function allows us to quickly sum up all the values by customer. We can also sort the data using the sort command. 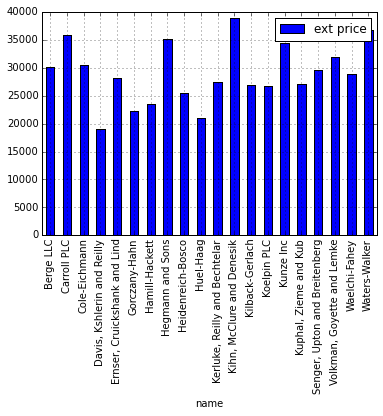 Now that we know what the data look like, it is very simple to create a quick bar chart plot. 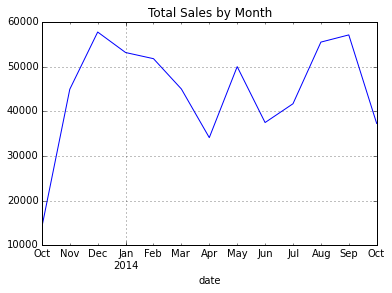 Using the IPython notebook, the graph will automatically display. This actually tells us a little about our biggest customers and how much difference there is between their sales and our smallest customers. 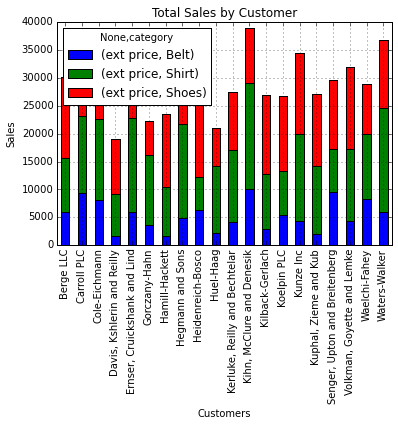 Now, let’s try to see how the sales break down by category. We can use groupby to organize the data by category and name. The category representation looks good but we need to break it apart to graph it as a stacked bar graph. unstack can do this for us. In order to clean this up a little bit, we can specify the figure size and customize the legend. Now that we know who the biggest customers are and how they purchase products, we might want to look at purchase patterns in more detail. 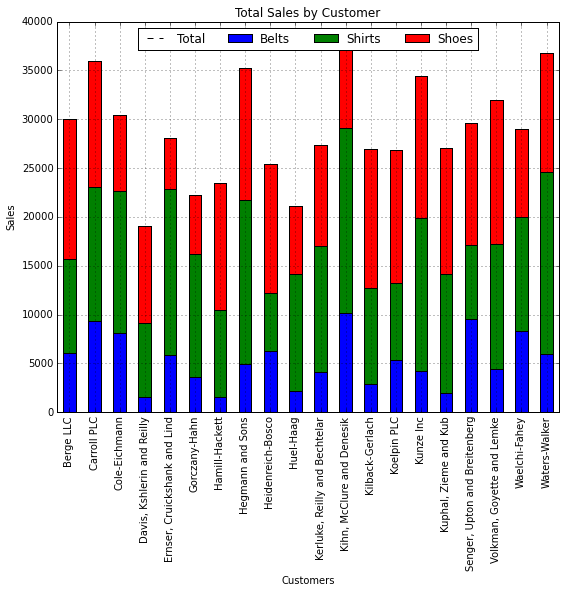 Let’s take another look at the data and try to see how large the individual purchases are. A histogram allows us to group purchases together so we can see how big the customer transactions are. 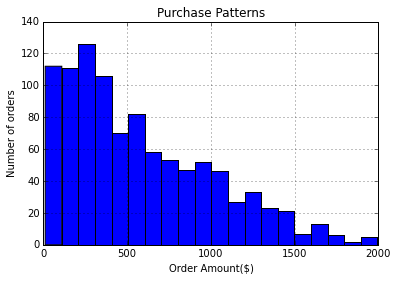 We can create a histogram with 20 bins to show the distribution of purchasing patterns. In looking at purchase patterns over time, we can see that most of our transactions are less than $500 and only a very few are about $1500. Let’s get the data down to order size and date. If we want to analyze the data by date, we need to set the date column as the index using set_index . One of the really cool things that pandas allows us to do is resample the data. If we want to look at the data by month, we can easily resample and sum it all up. You’ll notice I’m using ‘M’ as the period for resampling which means the data should be resampled on a month boundary. Looking at the chart, we can easily see that December is our peak month and April is the slowest. Let’s say we really like this plot and want to save it somewhere for a presentation. In my typical workflow, I would follow the process above of using an IPython notebook to play with the data and determine how best to make this process repeatable. If I intend to run this analysis on a periodic basis, I will create a standalone script that will do all this with one command. print "Data types in the file:"
print "Summary of the input file:"
print "Basic unit price stats:"
The impressive thing about this code is that in 55 lines (including comments), I’ve created a very powerful yet simple to understand program to repeatedly manipulate the data and create useful output. I hope this is useful. Feel free to provide feedback in the comments and let me know if this is helpful.